On November 3, wind power production in Denmark exceeded the level of power consumption. Craig Morris says the event was not even especially exceptional. 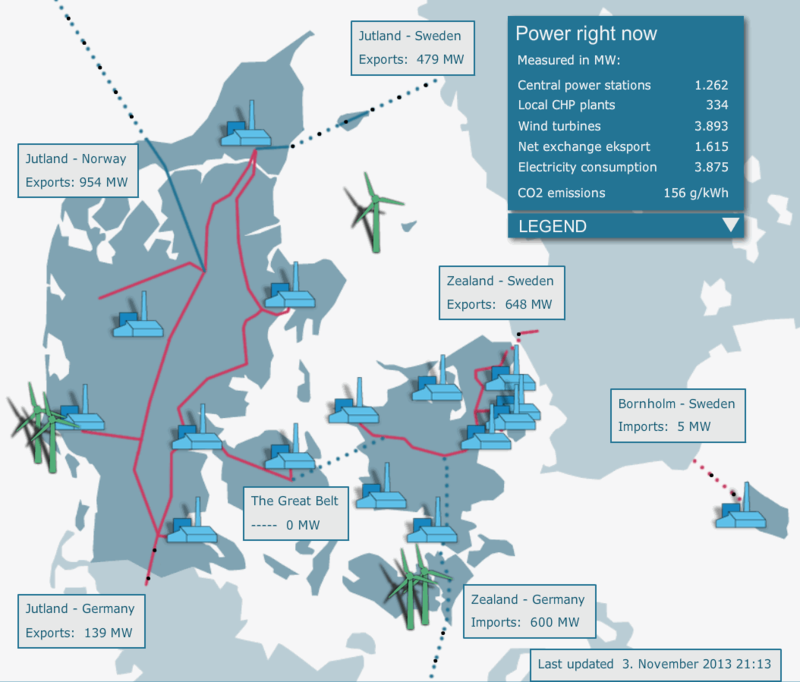 Denmark is flooded with electricity, and it is increasingly wind power. As you can see from this website of current power production, the Danes publish a real-time overview of their power sector broken down into the categories of central power stations, cogeneration (local CHP), and wind turbines. At those three together and subtract electricity consumption, and you get the net power exchange. When it is positive, the country is exporting. As you can see from the screenshot below, power production exceeded power consumption in the country on Sunday evening – when, admittedly, power demand is relatively low. But the days when renewable electricity completely offset conventional power on workdays are fast approaching. And Denmark has near 100 percent wind power increasingly often. One salient feature here is the export balance with Germany at that moment. As you can see from the bottom, the country was exporting 139 MW to Germany via a land connection but importing 600 MW via undersea cables. In other words, at a moment when Danish power exports made up roughly a third of total power production, the country had a net power deficit vis-à-vis Germany of some 461 MW, so Germany was covering roughly a seventh of Denmark’s power demand at the same time. The reason is quite simple – the wind conditions in neighboring northern Germany are roughly the same, so both countries had high wind power production. That evening, the approximately 34 gigawatts of wind power capacity installed in Germany was generating some 18 gigawatts of electricity, meaning that they were running at more than 50 percent of their rated capacity – compared to an average capacity factor over the year of below 20 percent. The combined effect is clear to see from the Danish screenshot. Denmark was exporting 954 MW to Norway alone when that screenshot above was taken, and the figure was a whopping 1,122 MW to Sweden. Essentially, the country’s conventional power plants and CHP units were all running for export, and the Danes still had some wind power imported from Germany to pass on. Here, we clearly see why Denmark has a more ambitious target for its energy transition – 100 percent renewable energy by 2050, compared to “at least” 60 percent renewable energy in Germany by the same year. The Danes have loads of relatively inexpensive wind power, and they plan to store the excess partly as heat simply by running electric heating systems when power is cheap. Eventually, it could also be stored chemically, such as via electrolysis to produce green hydrogen. At that point, the heat and transport sectors could theoretically also be served with excess green power. The German transition will be more challenging, partly because it is based more on solar, which will increase the need for seasonal chemical storage from the summer to the winter. Furthermore, German wind power is not quite as inexpensive as Denmark’s, and solar is more expensive than wind. Nonetheless, the comparison with Denmark shows why Germans justifiably do not think their energy transition is particularly radical. Good job Denmark,Your doing it right and leading the way to clean energy. The energy transition is not only producing, but also the use of the produced electricity. heating by heat pump, mobility by electric cars, that’s a simple way of storage. no need for gas oil coal nukes. and billions of euros to be made by the citizins of Europe. billions that are now paid and burned on fossil. Pingback: Student Energy Blog » THIS WEEK IN ENERGY! I already have wind energy and would prefer solar, but I’m happy to be off electricty! Thank You Denmark for showing the world WHAT CAN BE DONE! Intermittent baseloads, producing peak power most often during non-peak times, expensive subsidies, making people sick, ruining vistas and some people’s lives plus Denmark has cut CO2 emissions very little in the last 20 years and still generates about 50% of their electricity with coal. Wind energy the future, I think not. Did the wind industry in Denmark have to deal with negative comments about what wind mills look like? What about problems with birds? I am currently working on my bachelor thesis in the Netherlands. My thesis focuses on energy storage and I have to research how this is perceived by the Danish society. I would like to ask you to fill in this short questionnaire (2 minutes) and help me graduate! These are exciting developments. It’s also worth noting the use of biomass, which is a dispatchable source, that Germany has been leading the way with. Germany already has 100% RE towns, including with biomass. Next PostGermany’s PV sector: from boom to bust…and back again?